This year marks Studer Group Canada’s 10th anniversary. We’ve grown rapidly – from working with a small group of healthcare organizations in 2007 to supporting a diverse network of more than 20 leading organizations today. Our partners range from small rural hospitals to large community and regional health centres to major academic health science centres. The progress and leadership of this network was on full display at the healthcare Leadership and Improvement Conference 2017 in Toronto, presented by Huron and Studer Group Canada. Nearly 300 healthcare leaders explored a variety of tactics, tools and strategies aimed at improving every corner of our complex and multifaceted health systems. The information-packed agenda was connected by a common theme: high performance is as much about shared values and connecting to the core purpose of what we do – the why of healthcare – as it is about management systems and metrics. It is emotional as well as intellectual. It is about the heart and the mind. This blend of heart and mind is demonstrated in all of Mitch Hagins’ work. In honor of Mitch, the pioneering leader who guided Studer Group Canada throughout its dynamic first decade, the Living Values Award was introduced, and the first recipient will be announced at next year’s conference. The pathway to high reliability moves from achievement of organizational goals to sustainability and efficient, error-free performance. In a keynote talk, Mitch Hagins identified six key markers that guide healthcare organizations along a proven, predictable path to high reliability: 90-day plans, leader development, recognition and appreciation, choose wisely-choose daily, standardization, and coaching. Dave Marshall, managing director at Huron, introduced a logical framework for understanding the change processes needed for sustaining the consistent standards of excellence demanded by high reliability. Watch this 4-minute video clip of Dave Marshall in Toronto as he shares insights into why change in healthcare fails 70% of the time, introduces 5 key elements of a proven system that helps organizations embrace and succeed with change, and presents how to advance safety and quality. Comprehensive improvement programs relieve the pressure in overworked emergency departments. 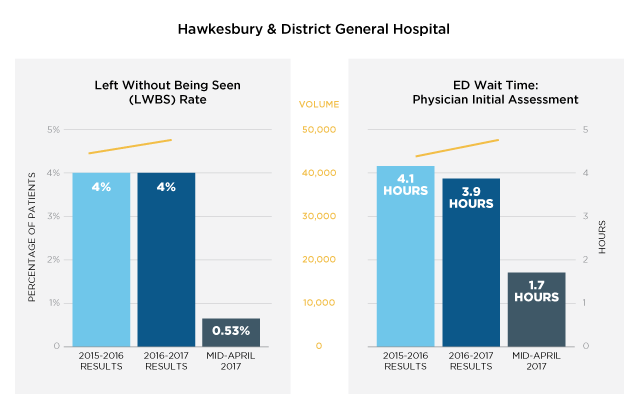 Hôpital Montfort in Ottawa and Hawkesbury and District General Hospital in Eastern Ontario were featured as examples of hospitals that have posted rapid, measurable gains in key ED performance indicators such as wait times, patient satisfaction and cost per case. Their formulas for success combine facility re-design and advanced patient flow management, with engagement strategies for patients, staff and physicians. Physician engagement can “make or break” an organizational culture. Dr. Lucas Chartier, an emergency physician at Toronto’s University Health Network (UHN), focused on building a positive, collaborative culture, and described proven tactics for driving physician engagement through communication, recognition, capacity-building, measurement and identification of physician champions. Organizations are customizing their own “toolboxes” of improvement methods. Caroline Roy-Egnar, VP of Human Resources at Hôpital Montfort, showed how her organization combines Lean with Evidence-Based Leadership℠ to create The Montfort Way. Studer Group Coach Carol Manson-McLeod described how the LEADS framework of the Canadian College of Health Leaders can be made more objective and productive in combination with Studer Group’s Leader Evaluation Manager®. Ron Gagnon, CEO of Sault Area Health, highlighted robust patient relations processes with extensive use of staff and patient testimonials as part of SAH’s iCcare program. Dr. Gillian Kernaghan, president and CEO at St. Joseph’s Health Care London, explained how her organization uses 360 Reviews to support the recruitment, evaluation, identification and development of leadership excellence. Peer-reviewed evidence confirms that patient experience is strongly correlated to both clinical and financial outcomes. Lynne Mahony, coach leader for Studer Group Canada, profiled the Canadian Patient Experience Survey – Inpatient Care (CPES-IC), developed by the Canadian Institute for Health Information (CIHI). She described how data are leveraged to improve patient experience, and offered lessons learned from more than 10 years of experience working to improve HCAHPS (Hospitals - Consumer Assessment of Healthcare Providers and Systems) survey results in the U.S.; CPES-IC includes 22 of the HCAHPS questions verbatim. Patient experience results in the U.S. are linked to financial reward and penalty. The number one reason employees leave organizations is because they have a poor relationship with their supervisor. A strong case was made for the importance of purposeful rounding for outcomes by Eric Hanna, president and CEO of Arnprior Regional Health. He offered rounding tips and tactics that drive engagement and, ultimately, performance. Rounding was also the focus of an in-depth lunch ‘n learn session on the MyRounding® software accelerator. Best practices for improving patient experience can be organized into a framework of Communication, Accommodation, Respect and Engagement (CARE). Dr. Ted James, surgical oncologist and medical director at BIDMC/Harvard and Studer Group coach and speaker, described the evidence behind the CARE framework and its proven impact on patient experience, clinical outcomes and organizational performance. 90-day planning sessions can be efficient, productive and integral to effective leadership. Mike Heenan, VP of strategy, communications and organizational effectiveness at St. Joseph’s Health Centre Toronto, described the practices his team uses to build discipline, rigor, alignment and accountability into 90-day planning. Seventy percent of our health outcomes are influenced by our own behaviours and decisions. Craig Swanson, president and co-founder of Insignia Health, described the Patient Activation Measure®, a system that quantifies patient engagement and helps predict health outcomes. Research shows that regardless of a clinician’s knowledge, he or she may be ineffective if unable to communicate well with patients. Studer Group Coach Maureen McCafferty provided a detailed examination of the AIDET® communication framework – Acknowledge, Introduce, Duration, Explanation, Thank you. This foundational communication tool provides rich rewards for both patients and providers. Health leaders must focus on the why, for every patient, every time, in even the most demanding circumstances. Bonnie Adamson, executive leadership consultant and speaker, told two equally compelling but very different stories. The first recalled her experience as CEO of North York General Hospital in 2003, when the organization became the epicenter of the SARS epidemic. A time of fear, adversity and extraordinary stress brought out countless demonstrations of empathy, courage and exceptional leadership. The second anecdote recounted her personal journey as caregiver for her husband during a 2 ½-year battle with terminal cancer. Seemingly small actions by front-line staff become profoundly important when viewed through the lens of patients and families. Ms. Adamson’s challenging and provocative advice got to the very core of what health leaders must do to truly deliver on the why. Conference host Bonnie Cochrane, RN, general manager, Studer Group Canada, guided the proceedings and helped delegates link to Studer Group’s network of partners, portfolio of healthcare leadership resources, and team of coaches, experts and support professionals. The takeaways listed above from the healthcare Leadership and Improvement Conference 2017 in Toronto offer just a brief introduction to these content-rich presentations and discussions. A multi-part series of Insight blogs, providing an in-depth look at key topics on the conference agenda, will publish soon on the complimentary resource section of StuderGroup.ca. Next year’s healthcare Leadership and Improvement Conference in Toronto promises to be filled with even more best practices and high-performing healthcare leadership, and we look forward to seeing you there!